I was blessed last night to speak at an event commemorating Executive Order 9066, issued February 19, 1942, which led to the incarceration of well over 100,000 Japanese Americans. The event was organized by the Asian Law Caucus and emphasized how important it is for vulnerable communities to work together. The path that led to the issuance of EO 9066 is hauntingly similar to the path that has culminated in the Executive Order issued by President Donald J Trump heralding a Muslim ban. Demonizing and then increasingly weightier political measures culminating with the almost unthinkable. One of the major differences between the political climate prevalent in the country during the time of Japanese mass incarceration and now is that there was no mass movement of people to defend their Japanese neighbors. That is not the case for Muslims. Millions are determined to stand with our community. We must, however, be willing to stand with them. Although not many outside of the Japanese community stood by their fellow countrymen, they did have their own heroes who resisted and fought the pernicious incarceration order. 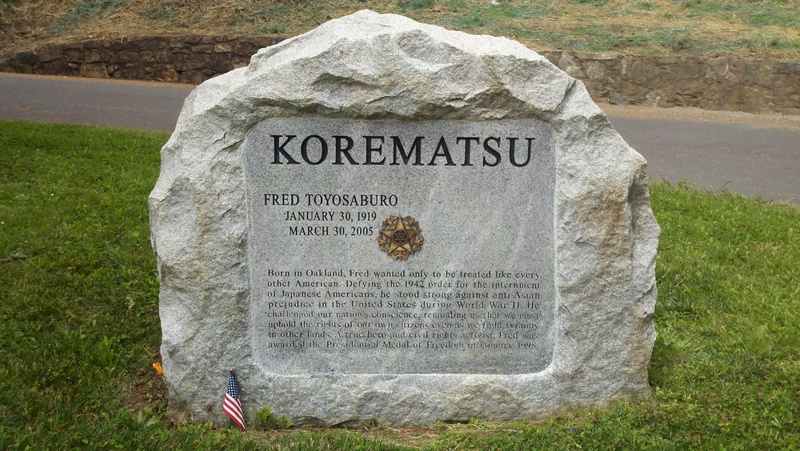 One of those heroes was Fred Karematsu who fought that unjust order all way to the US Supreme Court. He would have prevailed there had not the government suppressed evidence from the FBI, Navy and other high-level sources that the Japanese community in the US posed no security threat. As we prepare for the possibly heightened repression facing our community let us declare in one voice, with one spirit that we will all be Fred Karematsu! At the time of this commemoration, we thank our Japanese allies on their ongoing and unwavering support.